We just unveiled this one at PRI. This new system is based on the proven MegaSquirt-III design, but DIYAutoTune.com has revised it heavily to better meet the needs of professional tuners and racers. The MS3-Pro combines the features of the MS3 with MS3X, Knock Module, and Real Time Clock Board on a single circuit board in a sealed case. The o-ringed case is splashproof and, if you want continuous immersion resistance (the MS3-Pro displayed at PRI was at the bottom of a fish tank), it's easy to add a bead of silicone for extra protection. The MS3-Pro is ready to support a wide variety of engines out of the box, with the ability to run a V8 with sequential fuel and coil on plug, a V12 with sequential fuel and wasted spark ignition, or a four rotor Wankel with separate leading and trailing ignition outputs. Over 50 different ignition modes are supported, from mainstream applications like the GM LS1, Bosch Motronic, and Chrysler Gen III Hemis to unusual modes like Renix Jeeps and the Suzuki Swift GTI. 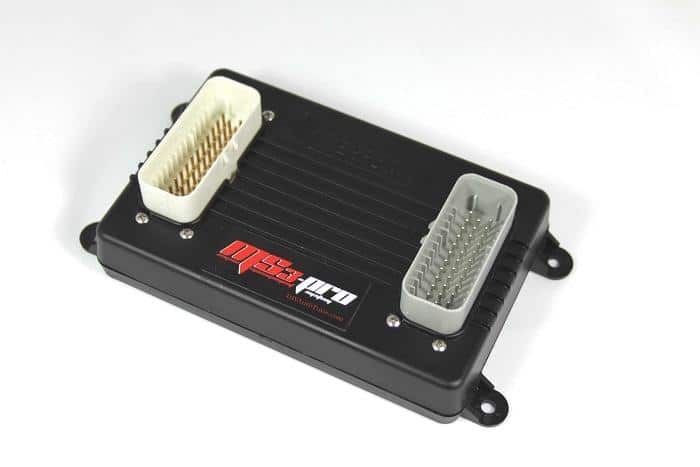 The MS3-Pro's packaging is a departure from most previous MegaSquirt EFI Systems, although it has a noticeable resemblance to the V3 MicroSquirt. Instead of the industrial looking split aluminum case and D-sub connectors, the MS3-Pro uses a sealed high temperature nylon case for light weight and compact size, and heavy duty AMPSEAL connectors. This provides a compact and sealed enclosure protecting the sensitive internals from the elements. The MS3-Pro's design keeps the heat generated to a minimum, allowing it to use a lighter plastic case instead of a metal heat sink. Retail pricing for both the ECU and wiring harness will be under $1,200. Expect it to hit the shelves by January 1, 2013. Click here for more details on the MS3-Pro. Quick Reply: Introducing the MS3-Pro ECU!